Q: You were here at the beginning of the season, now you are back and a lot of things happened in between. Hod do you feel about your season? A: When I skated here in the beginning of the season for Nebelhorn-Trophy I think I skated good and also the points were good.After that in the Grand Prix I didn't skate well as Nationals as well. So I was frustated to myself and I started to work again after new year. I've done one competiton before this in Japan in National events. I skated very good here, too. Im really satisfied with the result here and points. This is my last competition for this season and so I'm very happy with this so that I could finish this season with good feelings. Q: How hard was it for you to compete at Nationals while your wife expected your second baby any day? A: It was very hard because I have to be on the podium to make the World team. So I was very, very nervous and I think I showed that feeling on the ice (laughts) all the time. After training after New Year I realised that I could do it like (I did) in this competition. So I think that's a good thing I could find here. Q: How is your new baby boy doing? Q: What are your plans now after Bavarian Open? A: I take a week off and then I go back to train, maybe doing choreography in March or April before my choreographer gets busy. Q: Do you already have any ideas? A: Not yet, I have to ask my choregrapher. Q: Wat was the most difficult moment of this season so far for you and how did you deal with it? A: I was injured last season and I had to skate very good with quad because there is high level now. I think that was most difficult things for me to compete. A: My goal is of course Sochi next season and skating better and better as this season goes. 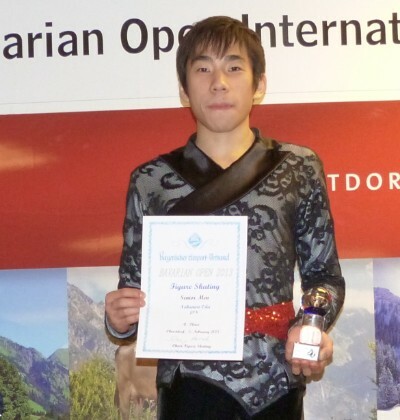 Q: There are very well performing skaters in Japan. How do you want to compete with them? A: I know Japan is very strong now (in Men's skating) and I need to beat them. Q: What are your strenght? What can you do to be better than the others?. A: I think that I need to do more like ballet and like to express myself more. And have to do a muscle training to jump higher. And then training on the ice and run throughs (of the programs). I think that's what I need to do. Q: What do you like most about skating? Or is there anything you don't like in this sport? A: I like jumps, but I don't like steps. Q: Thank you very much and all the best.